Book Clutter: Catching up on Some Reviews! Catching up on Some Reviews! Cleaning: Plain and Simple by Donna Smallin (2006, 290 pgs. ): I am convinced that this is some sign of reading sickness that I even read books about housework. I think I just get bored so easily, and if I can find some new method for doing laundry every few months, or learn some new homemade concoction for scrubbing the cabinets, cleaning could actually be a little bit fun! This one is actually one of the best I've read. It has some general advice, and then is divided up by room, and goes beyond the basics, including some natural cleaning options. There a many quotes scattered throughout the book, and I loved this one by Erma Bombeck: "My theory on housework is, if the item doesn't multiply, smell, catch fire, or block the refrigerator door, let it be. No one else cares. Why should you?" Amen to that! People of the Book by Geraldine Brooks (2008, 384 pgs. ): Hanna Heath accepts the assignment to restore the mysterious Sarajevo Haggadah, an ancient Jewish manuscript with stunning and unlikely "illuminations." She discovers a few clues to its history: an insect wing, a wine stain, salt crystals, and a white hair. The book alternates between her scientific discoveries about the clues and the stories of the past keepers of the Haggadah. I enjoyed reading it and had a hard time putting it down, although the fact that some parts are told in reverse-chronological order gave me a bit of mental vertigo. The last sentence cracks me up. It's code for "boring and complicated, with too many characters to keep track of." I was patient, but didn't feel rewarded. Northanger Abbey by Jane Austen (1798, 179 pgs. ): This is the only Austen book I hadn't read, and the saying "save the best for last" does not apply here. Another expression that keeps popping into my head is "you can't win them all." Jane Austen is truly a genius, and in most of her works, her wit jumps out from every page, every sentence and every word. In Northanger Abbey, it just emerges every once in a while. I didn't hate it though--it is Jane Austen for heaven's sake! (Kind of like The Avengers is one of the lamest movies ever made, but Ralph Fiennes is in it, so I'll enjoy it anyway). Also, Catherine Morland reminded me so much of myself that it was scary--reads too much, bends her will to please others, and cries a lot. I've watched about a third of the movie so far, and have learned that I have been pronouncing the title all wrong. It should be North-Anger--anger as in mad. But everyone likely knew that except for me. Thank goodness I've gotten all of this off my chest and into the blogosphere. I can sleep without having nightmares about review-evasion agents coming to get me. My parents and sisters read The Known World and gave it high praises, but I just couldn't get into that book. I keep wondering if I'm really missing something. Love your reviews. 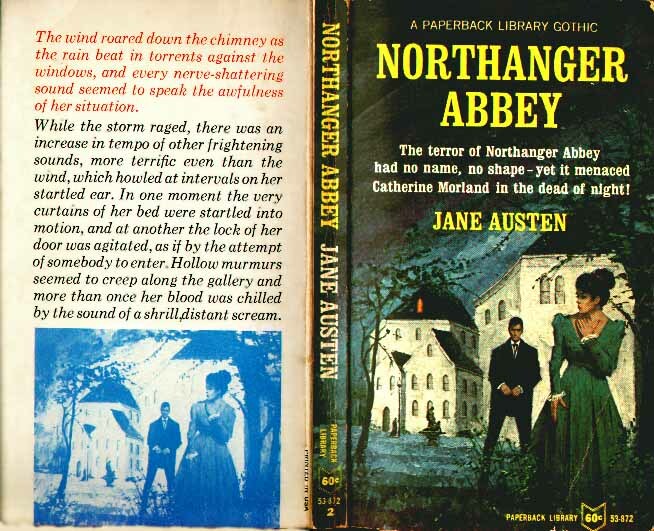 I haven't read Northanger Abbey but heard that it was published after Jane Austen's death and she may not have meant for it to be published at all. I would like to read "People of the Book". I read "Year of Wonders" by Brooks and liked it a lot until the last few chapters and then she went crazy with it. It sounds like this one will be better. I've been meaning to read "The Uglies" but haven't gotten to it yet. My TBR list is getting so big! I feel you on The Known World. It took me forever to get through that one. I really liked People of the Book. I thought Uglies was pretty good. I've got the rest of the series sitting on my shelf - I really need to get to it. Heyy.. have u read Pretties by that Scott guy. I'd really like a review of that book. Also, can u suggest some more fantasy books. Recently i have delved into the fantasy genre and absolutely enjoyed it. The books i am refferring to are The Chronicles of Narnia by CS Lewis. They are simply fantastic and caught me awestruck at the man's creativity and imagination. So plz suggest something equivalent. I'm a big fan of the Uglies trilogy - it came highly recommended by my 17 year old sister that hates reading. Didn't like Extras as much, but it was still a good read. I haven't read any of the others in this group, but I do think it's really impressive that you review every book you read! Imagine how embarrassed my kids are when their DAD reads Uglies. "Dad, that's a girls book!" I tell them it's research since I also write YA, but the truth is I love a good book regardless of who its target audience is. I just finished Uglies and loved it too. I also compared it to Lowry!